You just want to stay in bed and pull the covers over your head. If you do manage to climb out of bed, dress and head for work, you seriously contemplate veering off your normal route and heading straight for the park or countryside? Maybe you decide to eat dessert first, or just eat dessert all day long? Yesterday was one of those days around here. Instead, I went diving in the depths of my sewing room drawers and found this little bonnet. I knew that its bright colors and cheerful print would make the sun shine -- even if the sun was hiding behind both real and figurative clouds yesterday. This is defnitely a different bonnet from the ones shared earlier this week! 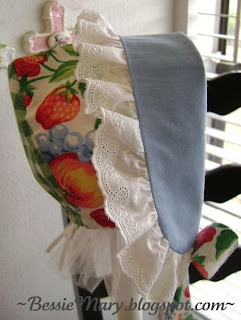 It was actually my "muslin" made several years ago trying a pattern from the March/April 1995 issue of Sew Beautiful. Looking at it, there are several things I would now do differently. But I do love the streamer embellishments, and that is what we have been discussing. I used two layers of cotton organdy and a built-in leaf motif on my sewing machine. I stitched the leaf out four times -- two leaves for each side of the bonnet. Trim the leaves close to the outline stitching. Looks like I could have trimmed a little better in a couple of places, too! Position on your bonnet and tack in place with a button. 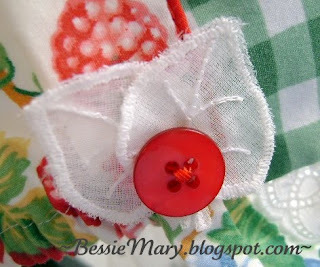 Today, I might select a slightly more dainty button for this project! The streamers for this bonnet are lengths of the bonnet fabric sandwiched between the outer bonnet fabric and bonnet lining. When stitching them to the bonnet, I took a small tuck in the streamer. Taking a tuck in the streamer, whether it is ribbon or fabric, just seems to make make them a little more graceful! The design of this bonnet makes it possible to flip the brim back, and create a completely different look. It also allows for the creative use of several coordinating fabrics. I think it is just as sweet constructed with batiste, dotted swiss or other fine fabrics. Every now and then we need to venture down a different path. In coming days, we will return to the land of heirloom sewing, lace and ribbon rosettes. Or, I may just stay on this side of the fence and frolic a little longer! The little baby wearing this bonnet would have a touch of green on this St. Paddy's Day! 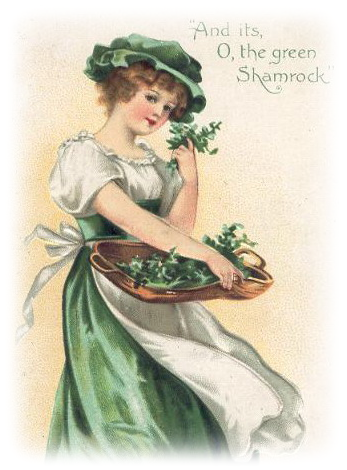 Wishing all of you the luck of the Irish, today and always! Another triumph! I completely relate to your having "one of THOSE days" - they happen around here, too. In fact, I had the day off yesterday due to flooding and did very little except write and read. Today, I am off yet again (flooding and schools are closed) but hope to be more productive. Thanks for sharing on your blog! That bonnet makes me smile! I love it. Your creativity is so inspiring dear. Thank you for sharing yoru pretties and especially your gift of writing. This is my favorite yet!!! I love the happy fabric. I think everything is perfect the way it is! I have lots of those days! Love the bonnet. It looks like a "day at the park." 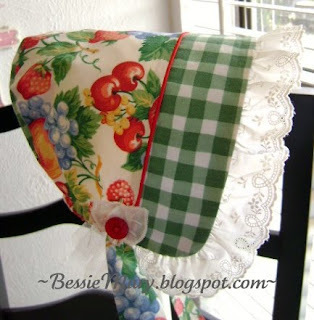 Something looked familar about the fabric....I had the same print for my kitchen curtains years ago! How cute! Happy St. Patrick's Day! Love those little leaves. How cute are they?? I would never have thought of that. Cute cute cute. How wonderfully creative!! I love it! Happy St. Paddy's Day to you too!